For a luxurious and healthier extended lens-wearing experience, there couldn't be a better pick than Biofinity Toric contact lenses. 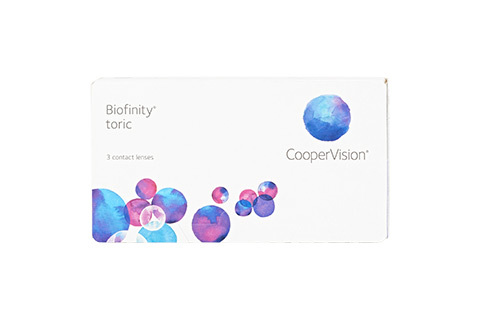 Presented by CooperVision, one of the most trustednames in the eye care industry, these monthly disposable contact lenses are recommended for nearsighted and farsighted vision. Featuringthe cutting-edge Aquaform technology, Biofinity Toric contact lenses allow excellent oxygen permeability to your eyes, keeping them moist throughout the lens wearing duration. The unique silicone hydrogel material makes the lenses a great choice for people who travel a lot and lead a busy lifestyle. Reason? You are free to wear Biofinity Toric Monthly disposable contact lenses consecutively for up to seven days. Right from morning till late in the night, your eyes will stay comfortable, moist and healthy. What's more, the natural wettability of the lens material eliminates the need for additional wetting drops. So you can focus on doing what you love the most instead of taking care of your lenses. At Mister Spex, you can shop for Biofinity Toric Monthly disposable contact lenses with complete peace of mind, as we provide friendly and professional assistance, 30 day hassle-free returns, and fast and trackable door delivery across Europe.